As Paradise Falls' new full-length album Digital Ritual will be out Friday 21st July and they’ve just revealed the latest track from the record, The Ultimate Consumer. The lead-in to this album has not been easy, but with positive goings-on such as multiple tracks added to Spotify Australia's Homegrown & Heavy playlist, the video for Star Blind premiered on UK's Metal Hammer website and Heavy Mag saying the album is "Undulated with power, passion and metal mastery, As Paradise Falls do themselves proud with Digital Ritual", the band's fire & passion has been stoked all along the way. Vocalist for the Brisbane metal outfit, Shaun Coar, mused that "The song is about how people fall into destructive behaviour patterns. Particularly with the way we consume everything thru media in this day in age. A lot of people are borderline addicted to their phones and the amount of data we consume per year grows exponentially. It's having a trickle down effect culturally and on a personal level. Literally everything needs to be at your fingertips otherwise it cannot survive. The problem is great things don't just happen instantly." 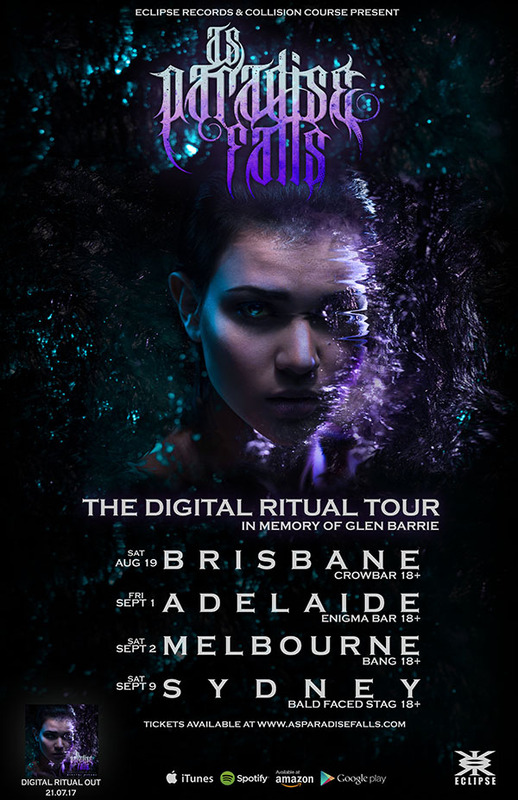 As Paradise Falls are embarking on a tour through August and September to celebrate the record - and are also today announcing the supports. Brisbane's Crowbar show gets Down Royale (their Final Show ever), Zeolite (TAS), Caetera and Setmeonfire (NSW), Adelaide's show at Enigma Bar will see Valhalla, Beyond These Waters and Temple Of Athena, Melbourne's BANG show is a split affair with APF and Mirrors on early, then a late show with Trash Boat (UK) and Between Me & You, and Sydney's The Bald Faced Stag sees Oh/Villain, Isotopes, Setmeonfire and Above, Below. Digital Ritual is already available for pre-order via iTunes and Amazon. Both options come with the songs Star Blind and Digital Ritual as instant free tracks! The album is also available to pre-order via Google Play. The single Dead Message is already streaming via Spotify, Apple Music, and Deezer. Additional options and information about Digital Ritual is available at Eclipse Records. Sat 2nd Sept - Melbourne, BANG!